John with a beauty from his trip this week. Fishing this past week took a bit of a turn. The previous weekend was good, but as the week progressed the fishing did finally slow down a bit. We can’t really complain though, the fishing had been good to great for a few weeks in a row off S. Bowen, so it was due to slow down. The fish are still around, the trick this past week was trying to find them and battling through the weeds. There were good bites from Gower all the way down to Cowan and if you were in the right place at the right time you had good fishing. I also think some of the fish were on the tidelines but the weeds and wood in those general areas were so bad last week you couldn’t fish the areas effectively. The big winds and high tides will do that. Hopefully this week the debris moves on and we can fish some of the tidelines more effectively. Not much has changed for gear and depths. The bait and the fish are relatively shallow with good action between 60-120 on the riggers, sometimes even shallower first thing in the morning. Sean with a nice fish on a trip with Captain Eddie this week. We haven’t heard too much over at Thrasher as we spent the week fishing locally. Typically this time of year the best fishing is up on the structure and the offshore fishing slows down. I have talked to some other anglers that were at Thrasher this week and there seems to be a thick layer of algae or plankton starting at 100 feet down. This is a problem, as this time of year we are often fishing close to the bottom. This could be one of the reasons we have heard that the fishing is slower than normal at Thrasher for this time of year. We will have to wait and see how this scenario progresses. 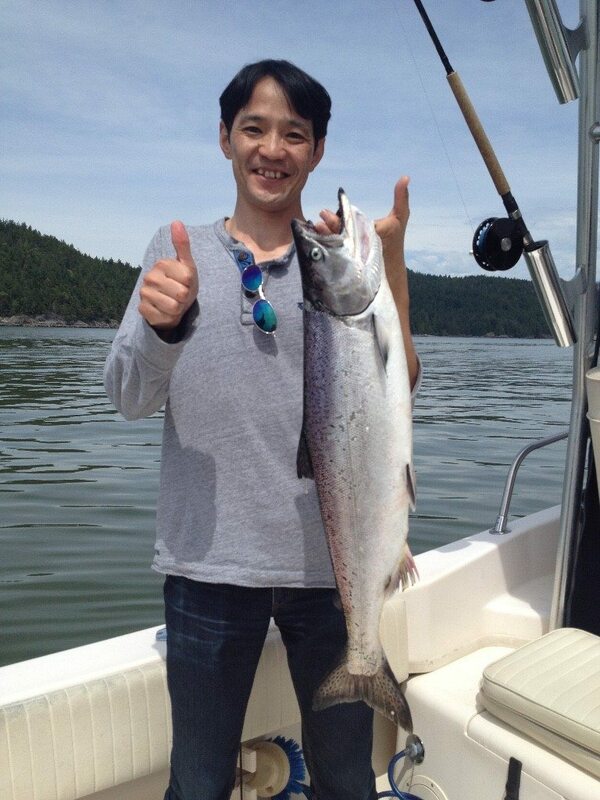 In the meantime we will continue to focus mostly on the S. Bowen area, as the catches there have been pretty good. 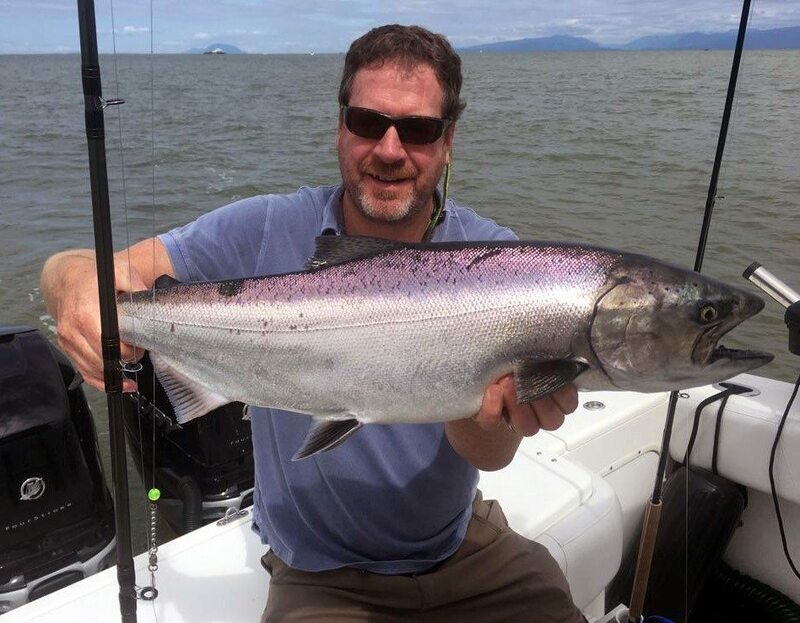 It can be a bit tricky to land on the fish or find the fish on a 5 hour or 6 hour charter as they move around so much, but on our 8 hour and 10 hour trips we have consistently been coming back with good numbers of nice sized chinook salmon. 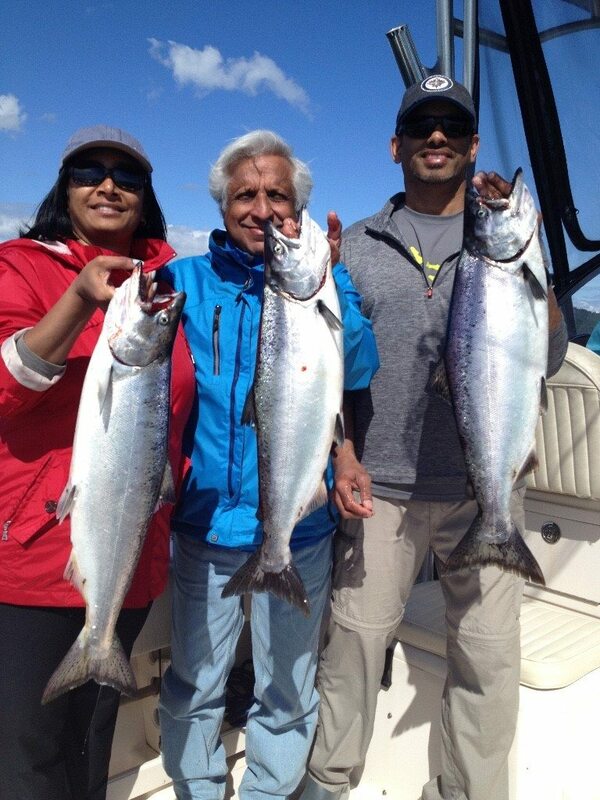 Zehra and crew all smiles with their catch from the day! The longer trips give us that extra time to get on the fish each day. Sometimes we can get on them first thing, but other days they have moved significantly from the previous days hot spot and our fleet of boats, working with other guide boats as well, need a few hours to get on top of them again. The crabbing has also picked up this week with the big males moving in. We will probably see the best crabbing of the year in the next 2 weeks, then the commercial fleet will open up and things will slow down dramatically as we get into late June and early July.